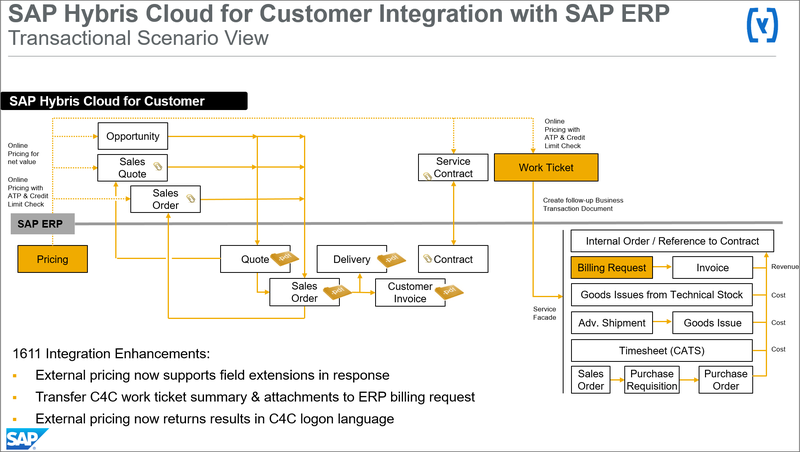 The document describes the new features we have added in SAP Hybris Cloud for Customer 1611 in the integration between C4C and SAP ERP. We start with an overview and then explain the features one-by-one. 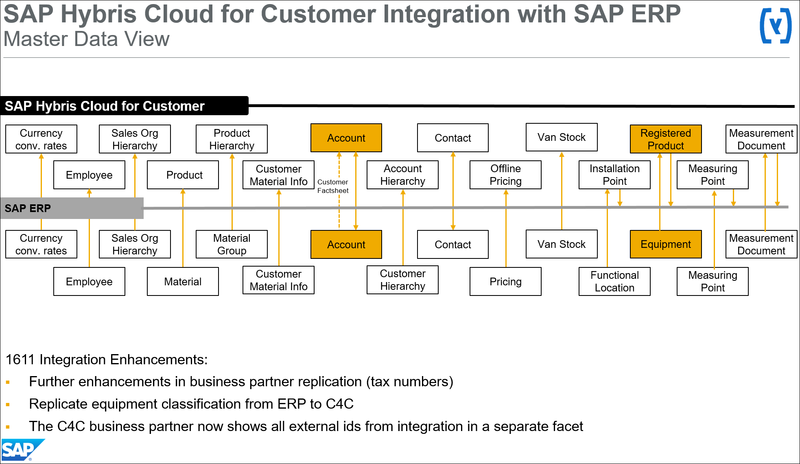 Here is the overview slide for the changes in the master data integration. and here the overview slide for the changes in the transactional data integration. In the following we explain the new features one by one starting with most prominent changes. to ERP now support extension fields for the request to ERP AND the response from ERP. Before 1611 we only supported extensions of the request part. We now exchange tax numbers between the Cloud for Customer Business Partner and the ERP customer master. Tax numbers are exchanged in both directions. Let’s show you an example. Here is a screenshot of an ERP customer master from the US that has tax numbers maintained. On this first screenshot you see the control data screen for that customer. On the right you see the help pop-up for the “Tax Number 1” field. 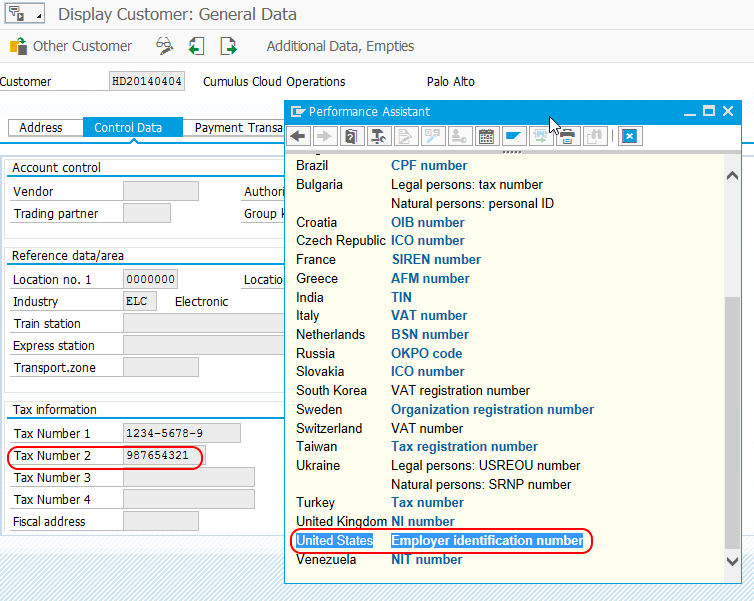 The ERP customer master has a fixed number of tax fields and the F1-help tells you in which country they are used and how. For US customers Tax Number 1 is used for the “Social security number”. On the second screenshot you see the same customer, only now I opened the F1-help for the “Tax Number 2” field. For US customers Tax Number 2 contains the “Employer identification number”. Cloud for Customer uses a different concept for tax numbers. There is a table of tax numbers. Each tax number is assigned to a country and has a qualifier what type of tax number it is. As stated above, tax numbers are exchanged in both directions, ERP to C4C and C4C to ERP. The ERP classification system is an easy option to extend ERP objects by additional attributes and values. In Cloud for Customer there is a similar concept, called “Attributes” that already is used to maintain marketing attributes for business partners. 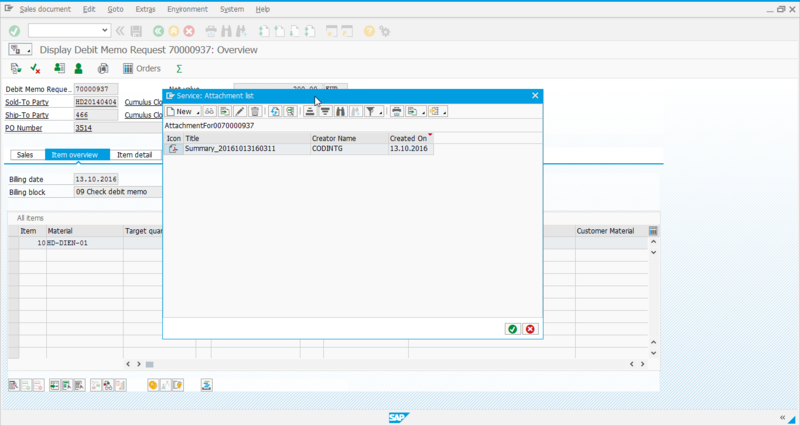 In release 1611 the C4C Registered Product has been enabled for attribute maintenance together with ERP integration. Let’s show you an example. In ERP we have two characteristics to better describe coffee machine equipments. The first characteristic measures the size of the coffee beans jar in liter. The second characteristic tells if the coffee machine supports brewing hot chocolate. This characteristic has predefined values 0 for “no” and 1 for “yes”. And finally we have a class containing these two characteristics. The Class type 002 tells that this class can be used for equipments. The characteristics and the class get automatically replicated to C4C. Here is the resulting attribute set in C4C showing the two attributes. 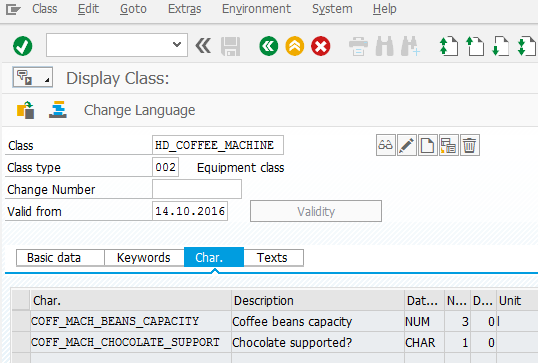 The value list for the “Chocolate supported?” attribute comes over to C4C as well. This is it for the setup. 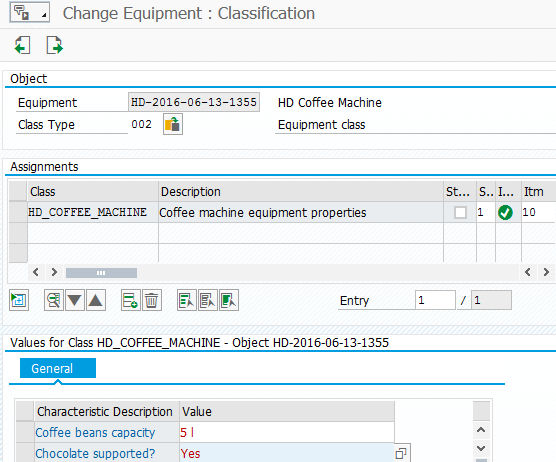 Now one can use the class and maintain the classification values for equipments. This is a screenshot of the ERP equipment classification. For the below equipment we said that it can take 5 liters of coffee beans and that it does support to brew hot chocolate. And this is how this information comes over to C4C. 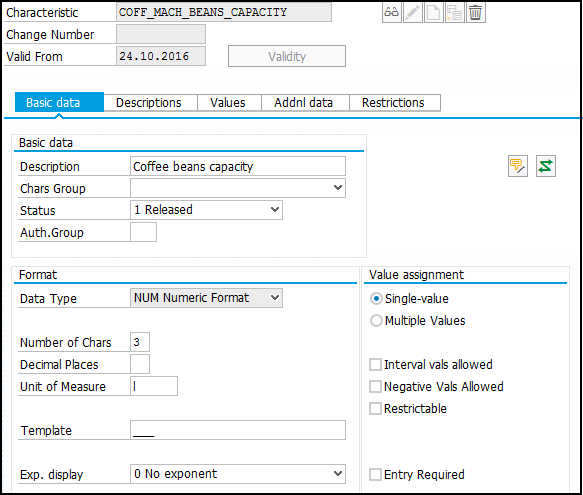 The attribute values can be created or changed in C4C. Updates are sent back to ERP. Please keep in mind: For 1702 we only support EQUIPMENT classification, not MATERIAL classification. The above values were maintained for one concrete equipment, not for the underlying material. We now send attachments over from the C4C work ticket to the ERP billing request. One use case for this is the ticket summary but it applies to all attachments added to the work ticket. 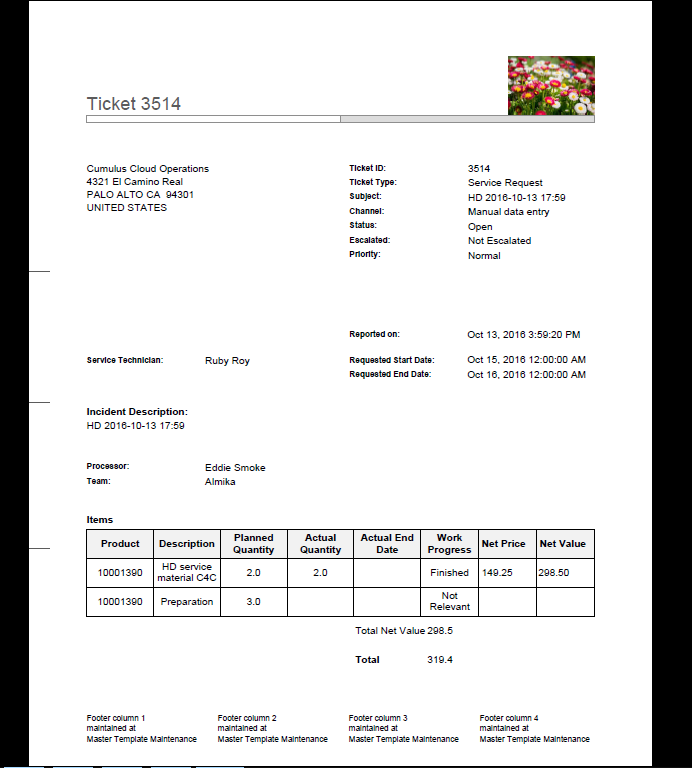 The sample focuses on the ticket summary use case. . Our sample C4C work ticket that has two items. In this example the first item is ERP relevant, the second one is not. The ERP billing request will only contain the first item. But let’s assume the second item contains some details that are important for the customer to check if the invoice is correct. To capture the complete information of the work ticket we generate a ticket summary via the action in the work ticket. In the above case this is the PDF file that is generated. You find it in the work ticket attachment facet. The release to ERP of the ticket generates the billing request in the ERP system. Here is a screenshot of the billing request where I opened the attachment pop-up. You see that the billing request only contains one of the two items. All details from the service ticket are visible in the attached ticket summary that looks the same as above. Please keep in mind that we send over ALL attachments to ERP. If you generate several ticket summaries for the work ticket all of them are sent over to ERP if you don’t delete the old summaries. The external pricing call from C4C to ERP uses a technical user to logon to the ERP system. Before 1611 the ERP messages returned from the ERP pricing call were shown in C4C in the logon language of the ERP technical user. If e.g. the ERP technical user was set to language English the messages in C4C occurred in English even if you were logged in French in C4C. We have adjusted that with release 1611. We pass the C4C logon language to ERP and return the messages from ERP in this language. Here is an example for a C4C sales order. I logged in to the C4C system in French and changed the division to 40 that doesn’t exist in ERP. I ran the order simulation and here is the screenshot of the C4C sales order showing the ERP messages showing the results of the simulation call. You see that the ERP messages show up in French. The first one e.g. says that the sales area 1000 10 40 doesn’t exist in ERP. This feature is available in the C4C Quote, the C4C Sales Order and the C4C Work Ticket. Before 1611 the business partner UI only showed one external id from integration even if several id existed. Before 1611 you had to go to the central UI for external ids to see all of them. Starting from 1611 the C4C business partner now has a new facet “Mapping for integration” that shows all business partners in other systems that this C4C business partner is connected to. This is a generic feature, not specific to ERP integration but used for all integration scenarios. Let’s start with an easy example. 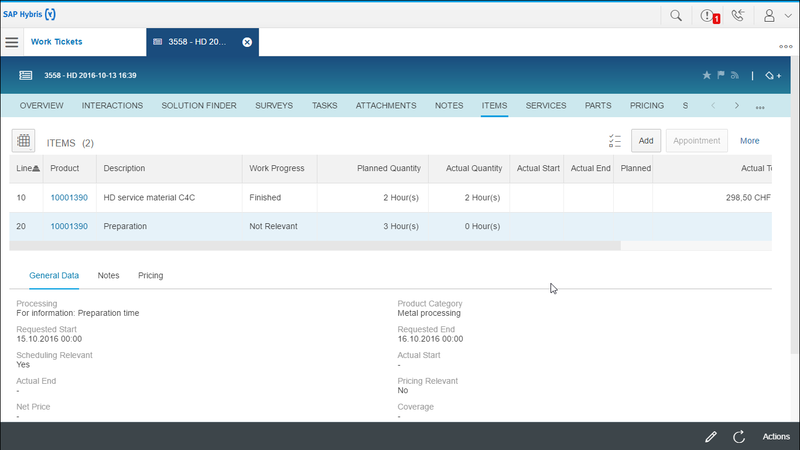 If your C4C system is integrated with one ERP system this is how it will look like. You see one entry with the ERP customer number and the ERP system id. Here you see two entries even the partner system id is the same. 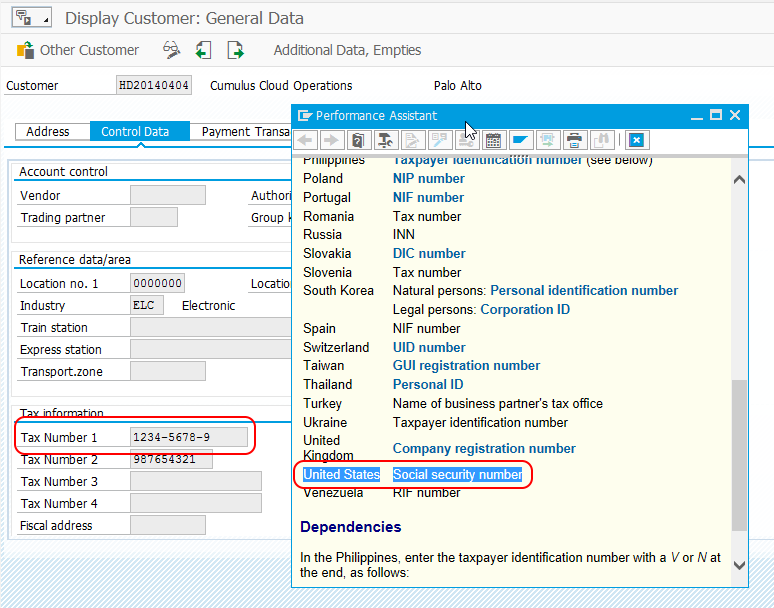 If you create a business partner in S/4HANA Enterprise a shadow customer master is created in S/4HANA and the ids may be different. Both ids are known to C4C and shown in the id mapping facet. 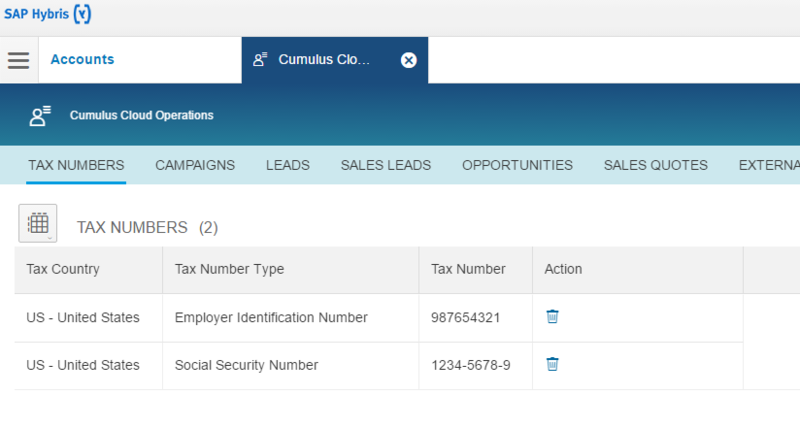 The ID Mapping Type tells you which is the S/4 Business Partner ID and which is the S/4 customer number. Where can I download this document? are there some more detailed information about Business Partner Tax Numbers and how to use this feature if I already have an C4C System connected with SAP ERP ? When i trigger the message from C4C->ECC will it update the ID mapping so that the incoming message from ECC picks this up and updates the correct prospect? yes we support this scenario. There is a BC setting that blocks prospects from being sent to ERP. If enabled, the business partner is sent to ERP for the first time when the prospect flag is removed. In the C4C outbound the ERP number is set and written into the C4C id mapping. Later updates in ERP will update the existing C4C business partner based on this id mapping. How did you get that integration? Do you have some specific documentation to accomplish it?